That game was nuts. Luckily, we have a roundup of reaction from across the country to try to make sense of the Seahawks' 41-38 win over the Texans. Wanna hear something crazy? Of course you do. Russell Wilson had more yards (482) Sunday than the Seahawks did as a team (479). 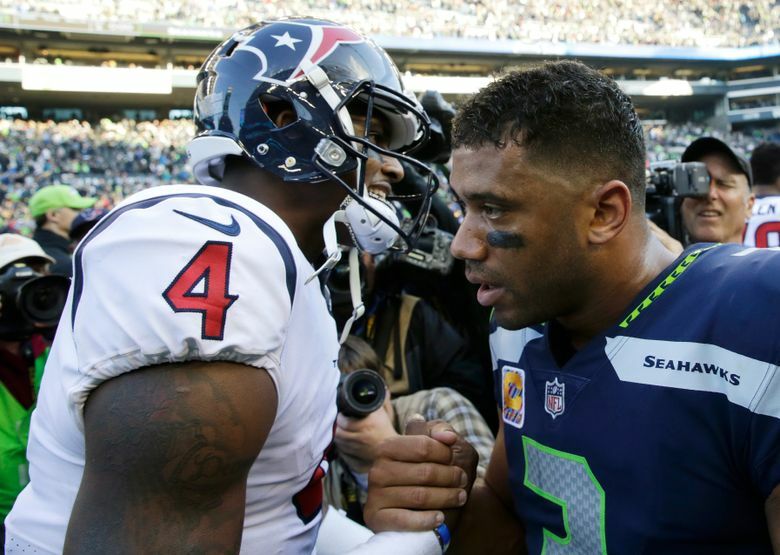 It was precisely that kind of wackiness that defined the Seahawks’ 41-38 win over the Texans — in what could well end up being the game of the NFL season. 79 points. 988 yards. 10 touchdowns. Six lead changes. One unforgettable game. If you (somehow) missed it, don’t fret. We’ve got you covered with a recap and highlights. Oh, and you probably haven’t seen the game-winning touchdown dubbed over Celine Dion’s ‘My Heart Will Go On.’ Thanks to the internet, you can do that here. If you did watch it, and you’re still trying to figure out how to process all of that football madness, here’s what you need to know. Russell Wilson = good. Deshaun Watson = also good. Seattle’s running game = very, very bad. National media members were left in awe of the Watson vs. Wilson show for much of the game, and it was just that — a show. As 710 ESPN’s Danny O’Neil pointed out, the Seahawks found out what it was like to face Russell Wilson, in facing the rookie phenom Watson. But ultimately, Wilson did what he does best: win. And the Seahawks needed every last ounce of Wilson’s playmaking to edge out a victory over Houston, because the team’s ground game and defense were nowhere to be found. As cornerback Richard Sherman said bluntly after the game: “He bailed us out,” referring to No. 3. 988 yds. 79 points. 10 touchdowns. 6 lead changes. 1 unforgettable game. Watson-Wilson: Duel of the year, and there’s been a few of them. NFL Network needs to replay Houston-Seattle about 17 times this week. “By pulling his team out of a September slumber, Wilson has vaulted himself into the MVP conversation at midseason. The Seahawks’ 1-2 start is becoming a distant memory. In its place is a team that’s climbing as it usually does when the intensity rises and the temperature drops later in the season. The Seahawks haven’t reached their peak yet, either. “Seattle’s inability to run the ball remains a troubling trend, one that could prevent a deep playoff run if it isn’t righted. The Seahawks rushed for only 33 yards against Houston, and 30 came from Wilson, as the trio of Eddie Lacy, Thomas Rawls and J.D. McKissic produced almost nothing. Deshaun Watson's passing chart vs SEA is interesting.